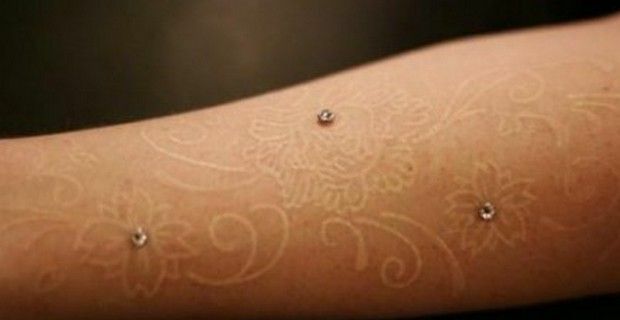 One of the latest trends in body art are white ink tattoos. Obviously a white ink tattoo is a tattoo that is done with white ink instead of black or other colors. These types of tattoos have seen a rise in popularity because they are a great solution for those people who want a tattoo, but for work reasons cannot openly display their body art, as white ink is more discreet and harder to spot. Tattoos done with white pigment look completely different from a traditional tattoo in black ink, as they are more subtle, unique and striking, because they appear like brands (or scarification). The ink used for these tattoos is thicker than other pigments, and the image will appear slightly lighter than the skin and look more like a scar or brand because of the added dimension. White tattoos look best on a light or fair complexions, while on darker skins, the tattoo will appear transparent rather than solid, and if you have problems with freckles, the image could result uneven. There are however a few issues with white ink tats. The main issue with white ink is that your skin could actually reject the white pigment, much more than the more common black ink, as the white ink could have more trouble being absorbed by the skin and you will have to be inked over several times to make the image more noticeable, and this lengthens the time spent under the tattoo artists’ needle. White tattoos also have the tendency to fade much faster than dark ones, and in some cases as they fade they seem to disappear, especially if a person spends a lot of time sunbathing. White ink also shouldn't be combined with a colored design, because the other colors will bleed into the white. If you should decide on a white ink tattoo, our advice is to ask your professional artist if this is the right choice for you.